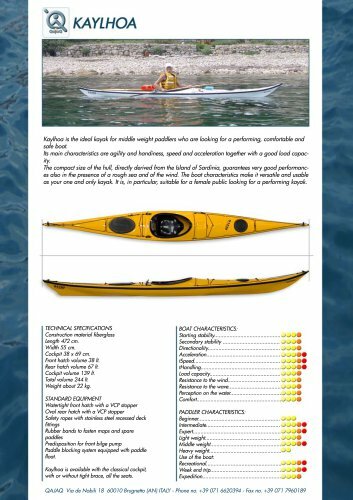 Kayfhoa is fib* ideal kayak for middfo wight paddfors who an looking for a performing, cornforlabk and its main chatad&fistlcs an aglttty and handlnass, sp&&d and acoaleration togdhsr wffh a good had capac- The compact SOB of tha htjU, dtnctfy dorivad from tfw kk^ of Sardinia, guunjttfaax *wy good pofhrmoTK- M aho infapneannofaroughsMandofmavttod. The boat ohamdertstlcs main it waofto and usabh as your one and only kayak His, in partrcuhr, surfabfo for a fomak pMc tookng for a performing kayak. TEQtNtCAt SPEQRCAJtONS SoUyjOfm^Hoi^t Wmmcftkt Pr$dhpOtfhon faf Aortf bifot pvMp KbyAoo * ovotioW* wi* A* oW**o/<oclp^ wm of waftotrf SoAf ©wo, 0# A* JOOfc.